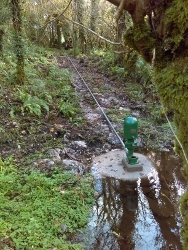 The new hydram is working well delivering a plentiful supply of water to our reservoir. But it became time to check all the water troughs on the farm in readiness for the grazing season. Suckler cows can drink gallons of water each day especially when it is hot and they are producing litres of milk for their suckling calf. 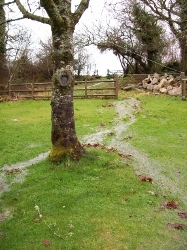 If a trough is damaged a leak can empty a field trough very quickly. They then push it around trying to get at the fresh water that is managing to fill it again and that can damage the pipes serving the trough and lead to an even bigger leak. 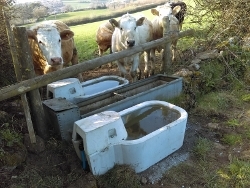 We found one of our very old large metal troughs, which was providing water to 2 fields, leaking and in need of replacement. We decided to put a new concrete trough in each field giving a dedicated supply to each field. 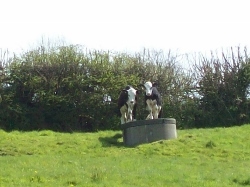 Each is a heavier trough so if the water did become low it makes it less likely to be moved by thirsty cows! Back in 2010 we signed into a Higher Level Stewardship agreement with Natural England which enabled us to provide up to 25 free guided walks a year. Over the years we have had many, many people including 3 year olds from our local pre-school and more mature folk up to 93! We have delivered varied and diverse content relevant to the groups visiting us including several primary schools, blind GCSE students, engineering degree students, prospective hydro developers, environmental students, art students, U3A groups, family groups, members of the Dartmoor Society, Dartmoor National Park, Dartmoor Preservation Association, WI, Natural History Society, Devon Wildlife Trust, groups interested in green energy schemes for their communities and many more. We are looking forward to welcoming another 25 groups this year, bookings are already being confirmed – will you be with one of them? Recently there has been a lot of interest in reducing the use of antibiotics in farm animals and people. Each one of us is responsible for using these drugs properly to ensure maximum benefit to us and our animals and to all who follow by ensuring they don’t lose their effectiveness. One way that we have reduced the need for antibiotics is to keep our herd as healthy as possible by prevention. We do this mainly by homeopathic treatments. 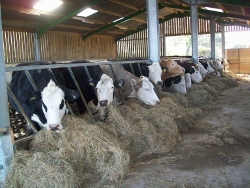 Our herd can be easily treated in their drinking water to prevent diseases such as mastitis, BVD, silage eye, Johnes disease, Leptospirosis, IBR, pneumonia, joint ill, red water, lice, ringworm and black leg. Homeopathic treatment is used the world over especially in organic farming and has been available in the UK since 1796. What a pity our own “powers that be” will not let us join their “Healthy Livestock” initiative unless we follow a narrow minded western medical path. Using a combination of both conventional and homeopathic treatments is surely the best way forward? One of the lasting memories for the Fursdon family during the 1960’s was of watching the old bungalow burning down. The fire brigade could not reach the building due to the narrow lane leading to the farm and with only a limited supply of drinking water available the family was unable to do much to prevent the total loss of the building. At the time of the fire Old Walls had a small hydraulic ram pump that provided all the fresh water directly to the farm and house but after more than 50 years of service the pipe work rusted out and we started using an electric pump. 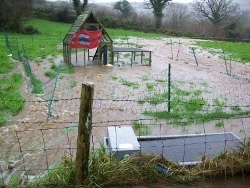 Since then we have installed a big water reservoir in our top field and fitted a water pump and hose by the house. It has always been Miles’s intention to reinstate the Hydram, using a bigger version, as the most sustainable way to transport water up hill to our reservoir tank in our highest field to keep it full all the time ready for domestic, farm or fire-fighting uses. As I write this the new Hydraulic ram pump system is being flushed out ready to start ensuring a constant supply of water directly from our own spring. On 28th May 1948 Miles’s father registered the Field Marshall, Series 2, Mark 1 for the road, it was brand new. On 30th July 2018 after 8 months in the workshop the newly restored Field Marshall, now 60 years old, has been paraded for the vintage tractor enthusiasts to view at a couple of local shows. 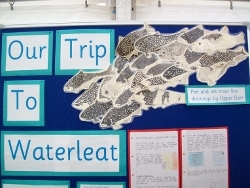 Our own very local show is Widecombe Fair which was on 11th September this year. Miles joined the parade of vintage tractors and implements in the main ring showing the visitors the progression through the ages of hay making equipment. 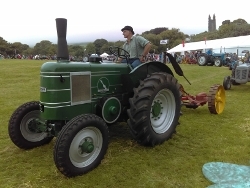 Our Field Marshall was pulling a trailed Bamford mower (note the tower of Widecombe Church in the background also known as The Cathedral of the Moor). During this hot weather the work has to go on but the planning behind it is geared up to ensure we make best use of the cool in the early morning and late evening. Stock work tends to be done late in the evening so the cattle can cool down after being handled and remain cool for a restful night. Unlike harvest work which must happen during the heat of the day the heavier outside manual work that is under our control can be done in the cool of the early morning. Digging post holes by hand on rocky Dartmoor ground is never easy so setting up a new perimeter around our big bales and storage area Miles set himself a target of one gate a morning before breakfast. He is well pleased with the result and has been able to continue in the workshop for the rest of the day without overheating. Before starting my farming life, I was given some very sage advice, “Where there is livestock there will be deadstock – be prepared”. 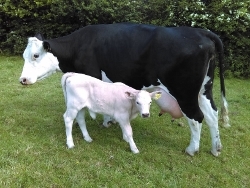 It came home to roost this month when we had to take the decision to have our faithful and productive commercial cow euthanised on the farm as she had become badly affected with arthritis and we were not prepared to put her in a trailer to transport her. She had been with us well over a decade, had produce a fine calf every year and found a place in our hearts. She liked nothing better than having a tickle with a big comb or just your fingers and would move around to show you just where she had an itch– as being demonstrated by our grandchildren in the photo. She was gentle, trusted humans and adored the attention. She has and will be greatly missed – farmers are softies but realists as well. What a month March has been. We arrive home from abroad 30 hours late at the beginning of the month to freezing temperatures and heavy snow, like much of the UK. 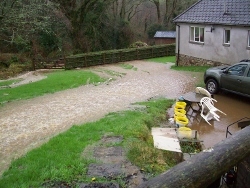 Then came the floods as the rain thawed the snow in double quick time. A week of showers and soggy ground followed which has necessitated our cattle staying in the sheds for longer than normal as they would have poached the ground to a muddy puddle. Luckily, we have enough winter food and bedding straw to see us through. Another bout of heavy snow saw us trapped on the moor for a few more days and today 26th March has seen the last of the drifts melt away in the sunshine! 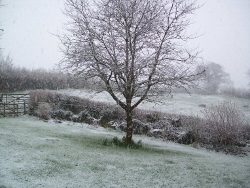 With more snow showers forecast for the hills over the Easter weekend you have to wonder what April will bring. 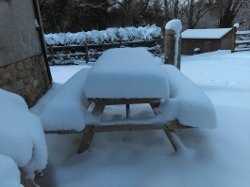 Anyone for tea on the patio? 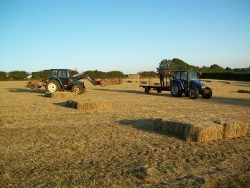 The second cut silage is cut, turned, baled and wrapped which finishes the harvest for this year. In between cleaning all the harvest equipment up and lightly oiling it before storing it for the winter there is time to enjoy the free harvest from the farm and teach the future generations what fun it can be to pick the fruit in the afternoon and eat it in the evening. 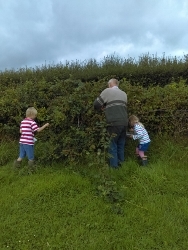 This picture is showing our grandchildren leaning about blackberries and they tell me the crumble they had for supper was delicious. During the year we make use of sloes for sloe gin, elderberry flowers for cordial and elderberries for jam, crab apples for jelly to go with pork, hips for rosehip syrup, haws for a fruit butter and rowan berries make a beautifully coloured jam. 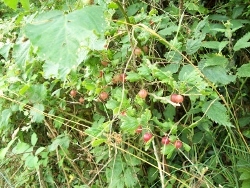 We also have gooseberries growing wild in our hedges on the farm for pies and wild strawberries to eat as soon as you find them! One of the office jobs that is on-going is keeping records of almost everything we do on the farm. I have recently been inspected so all our cattle can be sold with the Farm Assured tag. You will know this as the Red Tractor Logo that you find on British products in the shops. 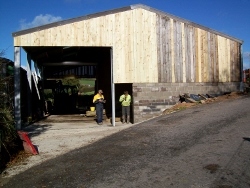 To achieve this status we have to show accurate, up to date, quantitive, identifiable and comprehensive records on:- emergency plans and procedures; staff and labour providers eg training undertaken; traceability eg ear tags and assurance status of animals bought; vermin control, how, what, where etc; housing, shelter and handling facilities are well kept, large enough and suitable for the livestock kept; feed and water, adequate and suitable; animal health and welfare including an annual herd health plan, records of any treatments and plans for emergencies; bucket reared calves are provided for as they have specific needs; biosecurity and disease control needs a written policy which is carried out in the real world, animal medicines and husbandry procedures are recorded accurately and undertaken by suitably qualified stockmen; fallen (dead) stock are dealt with in a timely manner effectively and efficiently; livestock transport must be adequate in size kept clean; environmental protections and contamination control carried out by certified operators, plans kept and records updated regularly. Whoever said cattle farming was all about “working outside in the fresh air” has never farmed! Under our HLS agreement we can start cutting our silage fields on 1st June, in an ideal world we would have started already to make use of the beautiful weather we have been having but Natural England works by the calendar, not nature, when prescribing stewardship schemes. 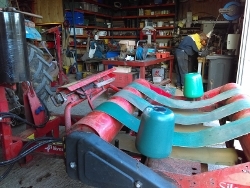 Our workshop has been busy while the boys are mending, maintaining and making ready all the harvest equipment including mower, turner, baler and bale wrapper. The tractor and handler get a good pressure wash after all the winter work to remove all the dung that accumulates over the months of winter yard work. The weather forecast for the 1st June is rain so we will have to wait a little longer before he harvest begins. Lichens are a close partnership between a fungus and an alga which is interwoven to appear as a single individual organism. They come in many and varied forms. 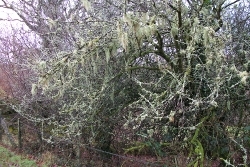 The picture shows a good example of beard and hair lichens in abundance on our trees just below Old Walls house. Lichen absorb water and minerals from rainwater and directly from the atmosphere, over their entire area. Different species grow in more polluted areas, e.g. industrial sites, than grow in our beautifully clean air on Dartmoor. As a general rule the greener the lichen the cleaner the air, the more yellow varieties the more polluted the air. One interesting fact about lichen is that the litmus dye used so widely as an acid/alkaline indicator in chemistry comes from lichens. After 20 years of growing, with only the first few years being tended, the new wood we planted is ripe for brashing. Technically this means “Removal of the lower dead branches, up to about two metres, of trees in a stand”. From the picture, you can see sky through the trees to our grazing field above. This half of the wood was brashed last winter. We are about to start on the other half nearest our intake. It’s hard heavy work all done on a 45% angle, hence doing it over 2 years. 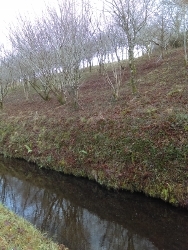 Hopefully it will allow the native bluebells, orchids and violets to flourish and it also allows us the pleasure of being able to walk upright in amongst the trees. The corn harvest is continuing apace up country in the arable areas of the south of England. This is where our straw comes from to bed our cattle down during the winter months. 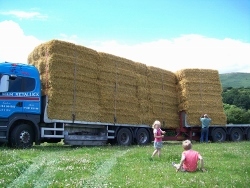 We bring it in as soon as possible after harvest to avoid any of the straw getting wet in the outside stacks that are awaiting lorries to transport them to cattle country. Miles brings ours in as he is a relief driver for the local H&M Retallick haulage firm. We can only get the lorry close to the buildings at Old Walls when the fields are dry enough to drive the lorry and drag on. This year has not been a problem as we have had very little rain and on a nice sunny day it becomes a family day. You can see the lorry and drag in the field next to our buildings with North Tor on Spitchwick Common in the background. We expect to cut, wilt and bale our 1st silage crop of the year in June. This year we were on track but had a temporary hold up due to a fawn. 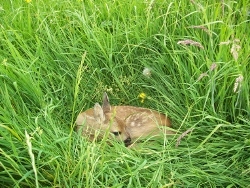 Our lovely long cutting grass is the perfect place for Row deer to hide their fawns. We suspected that this may have happened as we watch out for our resident doe and had spied her a couple of times in Lower Mills Close before we went to cut it. Miles managed to spot the fawn before he cut the headland and was able to move it into the long grass in the middle of the field in the hope that when he came back to cut the centre of the field the hind would have moved the fawn to another safer field, which indeed was the case. Mean while we were able to take the photo with my had in shot to show how small these animals are and how difficult to spot when mowing. What a frantic couple of days Miles and Luke have had. We have just experienced 2 whole days of dry weather this winter. This enabled urgent tractor work to be undertaken on the farms between dawn and dusk and every other daylight minute, even meals were taken in shifts to keep the tractors moving before the rain came again. Dung which has been accumulating during the winter from scraping out the feed channels in the cattle sheds was finally loaded up in the muck spreader and spread lightly on the fields which will be used for growing grass for the silage crop in June. This is a good natural source of nutrients. The other important job was hedge trimming. 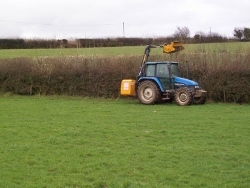 Under our HLS we are severely restricted on when we can trim hedges – only during January and February. 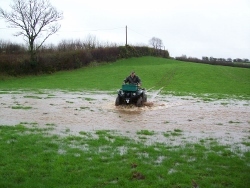 This has proved particularly difficult over the last few flood ridden years as you cannot take the tractors on sodden soil – it damages the soil structure which has long term productivity issues. Roll on the spring! To keep our herd productive and invigorated we have to replace some of our “old girls” from time to time. We have found that the best way is to buy baby calves and bucket rear them ourselves. 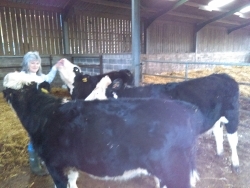 This enables us to buy the right cross breed, for us that is Hereford Friesian cross, who turn into great mothers and cope well with our wet, windy and cold climate at 1000ft. This autumn we bought 3 and the corresponding number of old cows will be fattened and sold during the summer months. 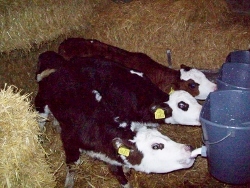 Rearing the calves on our farm also gives them the chance to develop immunity to the bugs and bacteria on our farm. They adjust to the mineral and trace element levels present in our soils, and therefore grass, before they become mothers themselves for the first time at about two and a half years old. 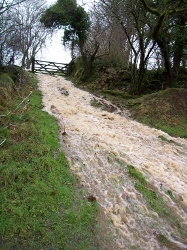 Once again we have experienced the power of nature with the quantity of rain dropped on Dartmoor in a very short space of time. 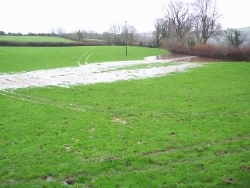 We watched the garden flood in just 30 minutes and a lake appear in one of our cutting fields. 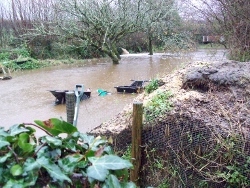 Our daughter’s garden disappeared under water too. As the rain flowed off the road, across our field through a hedge into Olands garden, down past the chicken coop, down again across our lawn and into the woods, it is hard to see how much more as farmers we can do as the Environment Agency and politicians are suggesting. 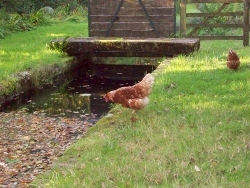 To help our self sufficiency along we have added a couple of chickens to our livestock list. They have such quirky characters and entertain us each evening while they have their hour of freedom in the garden. We have too many foxes about to allow them unrestricted freedom and plenty of cover in the woodland for the predators to wait their opportunity. With just the two of us at home it serves us very well with enough deep yellow yolked eggs each week to bake a big sponge, have some boiled eggs in our lunch time salads and enough left over for an omelette supper each week. Sorted! As the autumn advances and the days become cooler and damper it gives the opportunity for new growth. 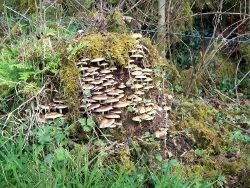 In one of our “species rich” fields, that Natural England identified, we have an old tree stump decorated with a colony of fungi. This field is treated according to our Higher Level Stewardship prescriptions – no fertilizer what so ever, no lime, no spraying, no harrowing and much more. For the reduction in farm production in this field we get compensated through our HLS and the unusual flora benefits. At last the urgency of calving and silage harvest is over and we can organise our time as we see fit rather than the cows or the grass dictating what we do and when! Obviously we still need to be mindful of what the elements can throw at us, like today with heavy rain and gusting winds. Luckily a few days ago the weather was fair and the ground dry enough to do some more work on our farm buildings which needed a track to the straw barn dug out to give a gentle curve around the building as well as a safe gradient. 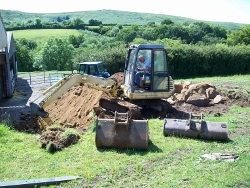 Miles has efficiently dealt with the topsoil, subsoil and the ever present Dartmoor granite. All that has been dug out has been gainfully used around the farm in other places. For example the subsoil then topsoil has been used on other fields to level out areas to enable then to be machine friendly or to increase the depth of topsoil where it is thin. Recycle, re-use as ever is our motto. The obvious jobs are the daily task of feeding silage to the cows, scraping the yards of slurry, spreading new straw on the cattle beds and breaking ice on the water troughs. During this time we also check the cattle over to make sure they are healthy with no foot problems from being on concrete floors or eye problems like silage eye. 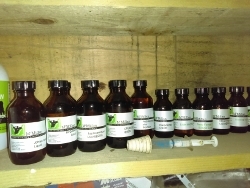 In January we will treat all the adult cattle for liver fluke and later with a mineral supplement bolus to counter the low levels of copper, cobalt and selenium and various other trace elements on our farm. Towards the end of winter we will wean the cows to give them a rest before they calve again in spring. With the short amount of daylight to work in outside and long dark nights it is time to start the workshop jobs in earnest; servicing all the machines in our new workshop, mending and creating new pieces of kit to make our work easier or more efficient. When the weather and soil conditions are right the tractors are fired up for dung spreading or hedge trimming (we are only allowed to cut hedges between 1st Jan and 28 Feb). This is just a small sample of what needs to be done and I haven’t even mentioned the office work. This time of year is often referred to as the quiet time of year – I have yet to work out why! 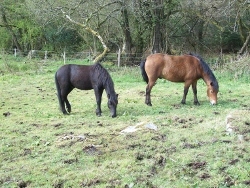 As well as the work we do with the cattle we also keep Dartmoor ponies. The Dartmoor pony year is dominated by checking the ponies on the open common daily. We drift the ponies off in the autumn over 2 days with all the other commoners, sort them out and bring ours home to wean their foals and worm the mares if necessary. If any of the mares are looking in poor condition they stay on the farm until they are well enough to return to the common. The foals are kept on the farm until we can find a buyer for them, they are used as conservation grazers, they are old enough to return to the common as part of our herd or as a last resort we sell them to the zoo for lion meat. If we are keeping them we have them chipped, inspected and passported as heritage Dartmoor ponies. The colts are gelded by the vet when they are about a year old. With our stallion we maintain a herd of 28 on Spitchwick Common. We are at the time of year when we have to start thinking about the future and all the things we need to prepare for. Uppermost in our minds at the moment is the field work. We need to harrow and roll all the fields we are laying up to cut for silage and hay later in the summer. This has to be done when the ground is moist enough to roll flat but dry enough not to leave tractor wheel ruts so when we come to cut the grass we keep soil out of the grass mixture to be made into big bale silage. 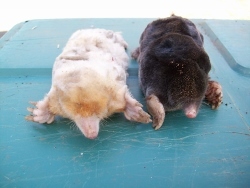 One of the many pests we have to deal with are moles. They love the moist soil beneath grass as it contains so many worms but the mole hills they leave behind can contaminate our grass silage and one mole hill can rot one big bale of silage. The answer is to catch the moles in the spring thus eliminating the mole hills. This year we have been successful with our catching programme but also surprised by catching, for the first time, a white mole. Rare but not unheard of. What a difference in the weather and for us a huge difference is what we can do and when we can harvest. One of the joys of walking around the farm in the summer months has always been the wonderful surprises of the hedgerows. This year I have already picked a glorious crop of gooseberries, wild strawberries, sloes and raspberries. I am now looking forward to the blackberry crop which is looking good for jam, wine and good old fashioned crumble for pudding. We will also benefit from elderberries for jam, rosehips for syrup, crab apples for jelly sauce and hazelnuts to crunch later in the year. Money cannot buy the joy of harvesting food for free! Payday comes but once a year for us from the cattle. 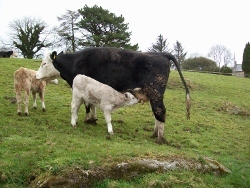 Each year we calve our cows in spring and the cows suckle their calves for 10 months – hence the name Suckler cows. These calves are then weaned and when winter finishes, which was very late this year, they go into the fields to eat nutritious young spring grass. When they are 15 or 16 months old and are looking really healthy having lost their shaggy winter coats and are growing well we take them to Newton Abbot Market and sell them for other farmers to fatten them. It is an exciting day but also nerve wracking as the price we receive will depend on who is looking for cattle that day and what price they are willing to pay at the auction. What a joy having a few hours of sunshine is, it lifts the spirit and work pace! The lack of sunshine last summer has had a lasting effect on our cows. We would normally expect to be 75% through calving by now but we have only had 25% of our cows calve so far this spring. Having checked the feed, mineral supplements and health of our cattle I pondered what could be the cause of so many cows calving late. Sunshine is the answer or lack thereof! Last year when the bull came to visit it rained for the first 4 weeks he was with our cows, he and they huddled under hedges to shelter from the worst effects of the heavy downpours with never a thought to “getting together” to mate and make this years crop of calves arrive on time! Time will tell if my projection is right, that we will be busier than usual with calving cows the first week in May (2013) following a glorious week of sunshine in late July last year (2012) – 9 months ago! The timely arrival of the rain followed by some warmer weather has enabled our grass to get growing at a rate that allowed us to put all our cattle out onto the pastures. 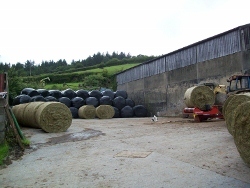 The cattle barns are being mucked out and the silage fields left un-grazed for the grass crop to grow on until there is enough tonnage of grass to cut it and turn it into our big bale silage – for next winters fed rations. It is clear that the cattle are contented now with the sun on their backs and the calves well fed, it’s time for a well earned rest. Corndon Tor makes a wonderful back drop! 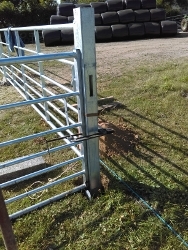 Some of the other jobs for the spring include, disbudding and castrating the calves, protecting the cows from flies with a pour-on fly repellent, clean out the cattle sheds and spread the dung, spot spray the injurious weeds e.g. docks, nettles, thistles and ragwort (this is part of the cross compliance rules we have to meet) and catch up on the paper work applying for cattle passports etc. 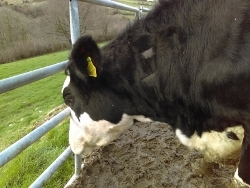 One worrying job for this week is our cattle’s TB test. Under our Higher Level Stewardship on the farm we have planted a small new section of orchard which includes cider apple, plum and cherry trees. Our newly planted orchard is just showing signs that the trees have rooted in well with the cherry trees are already producing small leaves. The young apple trees have just been pruned to encourage them to bush out rather than shoot up, the stoned fruit trees will be pruned in the summer. 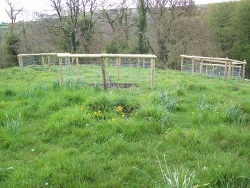 All are now protected from our wild deer with suitable fencing around each tree, this also means we can graze the field around the new trees with our cattle and Dartmoor heritage ponies without worrying that the trees will be eaten! 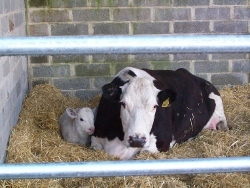 Evidence of one of the pleasures of farming – seeing a new born calf, just 12 hours old, safely cuddled up to its mum. We are still calving our cows inside due to the ferocious weather we have had over the last few days. The older calves born in the early part of the month are now going out by day into a lush grass field to “kick up their heels”; their mum’s are enjoying the sweet new season’s grass too. Despite the glorious weather we had through March we are still feeding our suckler cow’s winter rations. The grass has been slow to grow from lack of rain and warmth – although our days have been warm the nights have produced heavy frosts and have kept the soil temperature down. The cows have travelled back to the barns at Old Walls to be closer to home as they are due to calve through April and May. 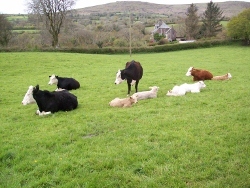 To date we have 4 new calves, all arrived without assistance and are doing well. With the change in the weather over the Easter weekend all the cattle were glad of some shelter from the howling winds and lashing rain.